Hawa Mahal, which when translated into English means the palace of winds, is one of the most unique and fascinating buildings in India. 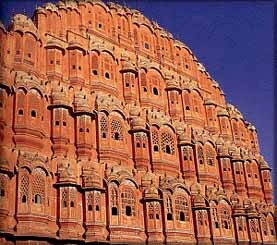 It is the most famous building among the tourist attractions in Jaipur. Brochures about tourism in Jaipur invariably include or highlight pictures of the Hawa Mahal. The Hawa Mahal, which should be described as a façade than a palace, was built by Maharaja Sawai Pratap Singh in 1799.The building is an extension of the zenana or the ladies quarters of the City Palace, another major tourist attraction in Jaipur. Pratap Singh was an ardent devotee of Lord Krishna, and close observation of the Hawa Mahal’s exterior makes it apparent that the building has been constructed as a giant crown worn by the Lord. The design of this building is attributed to Lal Chand Usta. The chief materials used in the structure are red and pink sandstone. The first thing that strikes the observer about the Hawa Mahal is the unique shape of the building, unmatched by any of the palaces of Jaipur. The strange pyramidal shape combined with the numerous screened windows (jharokhas) makes the structure look like a giant honeycomb. The main purpose of the building was to provide a vantage point for women of prominent families from where they could observe the various processions and ceremonies, while remaining hidden from public view. A total of 953 small windows face the streets, adorned by arched roofs. The screened windows of Hawa Mahal filter sunlight and spread it all over the floor, providing a spectacular sight for the onlooker. The windows also allow circulation of air in a way that keeps the floors cool even in the oppressive heat of Rajasthan. There are 5 stories in the building. There are two courtyards at the base, while the top three floors barely have the width of a proper room, an indication that the building was not meant for residential purposes. The building offers a wonderful panoramic view of the city. The best time to visit the Hawa Mahal is at dawn, when the sun’s rays slowly enter the building through the windows, creating a surreal effect.